Manhattan Universal Laptop VESA Holder - Laptop/Notebook Tray Holder for VESA Mount Stand; Supports VESA Standards 75 x 75 or 100 x 100 mm, Retail Box, Limited Lifetime Warranty. The Manhattan Universal Laptop VESA Holder allows laptops to be installed above the desk to give back much-needed desktop real estate. The holder attaches quickly and securely to a 75 x 75 or 100 x 100 mm VESA plate and standard display-mount arm. Users only need to connect relevant power and display cables and position the screen to their comfort for achieving an organized, efficient workspace. When it's time to go, the laptop can be quickly disconnected from its holder and placed in a briefcase or computer bag. 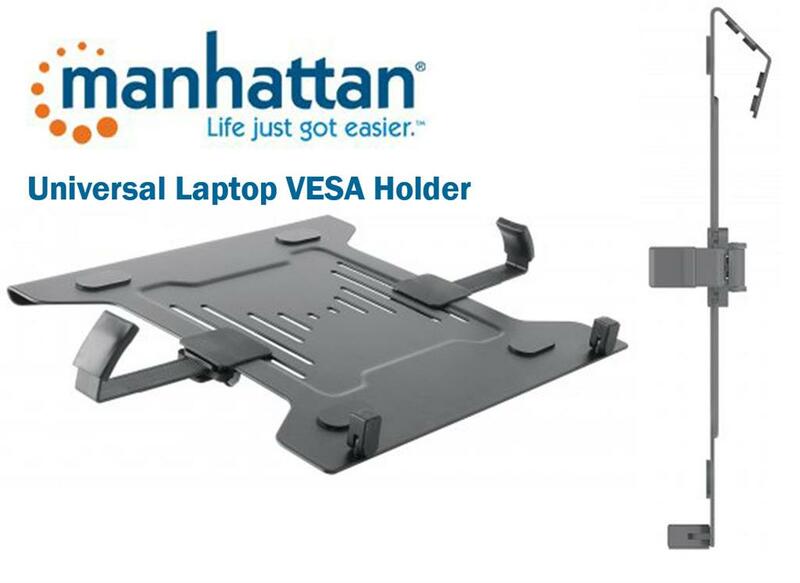 The Manhattan Universal Laptop VESA Holder is a perfect addition to any work or home-office set up. Heavy-duty steel and slip-resistant plastic clips keep the laptop in place for increased user confidence. Built-in air vents on the steel resting plate promote optimal circulation to keep laptop temperatures cool. The holder's adjustable side clips extend up to 420 mm (16.5 in.) so that any laptop can be securely arranged alongside a beautiful display. The heat generated from today's high-performance notebook computers can place an enormous burden on their internal circuitry, batteries and other internal electronic components. With space inside the shell becoming smaller, fans must work even harder to dissipate damaging heat to maintain a safe operating temperature range. 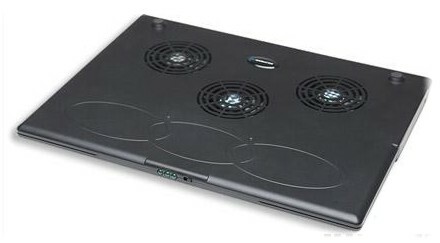 A MANHATTAN Notebook Computer Cooling Pad raises the notebook for improved air circulation and quiet fans help cool internal components to reduce critical temperature. Its compact size and lightweight makes it ideal for travel. This eliminates the need for complicated installation and external power supplies, adapters or cables.